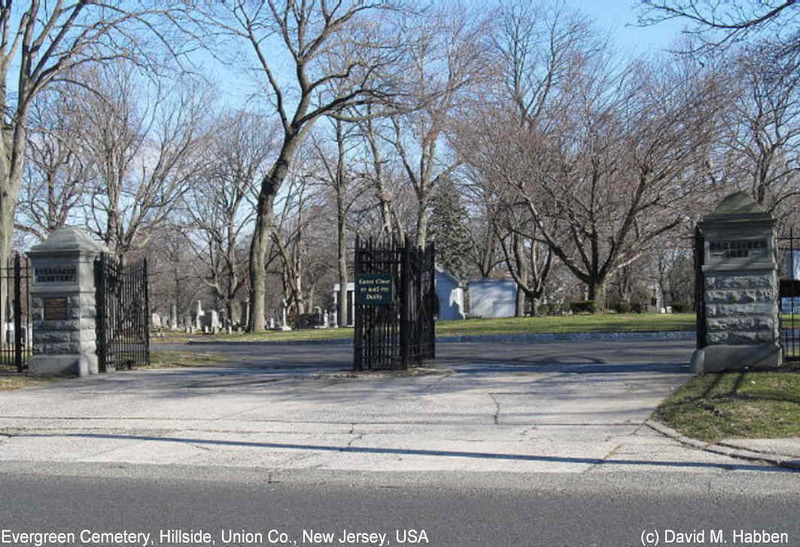 This 115-acre historical cemetery is located in Hillside, New Jersey, but since it is so large, parts are actually in adjacent cities of Elizabeth, and Newark. It has been in service since 1853. Since the township of Hillside was formally cut from the cities of Union, Elizabeth and Newark in 1910, the earliest interments may be documented as being in these cities. Office hours 8:00 am to 5:00 pm. Cemetery records housed on-site and available for searches. No appointment necessary, but research available by mail is done for a fee. It is under private management. Location of a grave should be given to fulfill a photo request. Since July 1991, the cemetery has been listed on both the New Jersey Register and the National Register of Historic Places. This is one of two cemeteries in the State of New Jersey that holds this honor. The grounds are well-kept with wide winding paths, shade trees, and many massive Greek Revival Monuments marking the older grave sites of the New Jersey's most wealthy and elite residents. Grave sites include noted authors, former U.S. Congressmen, pioneer families of New Jersey and Civil War soldiers, some who were Medal of Honor Recipients. In time as the community's culture became more diverse, so did those who were interred in this cemetery. As with any old cemetery, there are many graves that have become unmarked with time or with broken unreadable markers. The cemetery also is known for having a section of plots devoted to Roma (Gypsy) families.